The Gunners have been without the duo for two league games following the international break, and the latter witnessed them suffer a 1-0 away defeat at Everton. 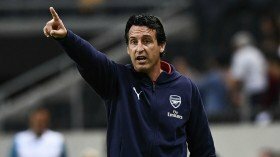 Speaking after that game, Emery admitted that he is unsure whether the duo will recover in time for the first leg of the Europa League quarter-final encounter against Napoli. "I don't know. We were waiting to see if Laurent could play today but yesterday morning we knew it wasn't possible. Xhaka is the same. They are going to be doubts for Thursday," he told Football.London. Arsenal continued their poor run on the road as they suffered yet another league defeat, but they are still placed in the fourth position in the standings after 32 games into the season. Their next match comes against Napoli on Thursday night, and the players should offer a much better performance, considering they have immensely fared well in their home patch this term.